And, we couldn’t agree more. The mobile ecosystem is crowded with a huge number of apps, yet it is far from being saturated. There is still a plenty of room for useful apps and out-of-the-box ideas. Recall the time, when you got a glimpse of a newly invented touchscreen. It was a gigantic hit as we were not only tapping but also swiping and escalating through an amazing peripheral. Now the touch gestures in Mobile App Development gaining more popularity. The era of mobile in-app gesture started mushrooming after adding combinations: long pressing, long press dragging and double tap etc. New features are constantly popping out, the cynosure is still on congenital workflows and natural behaviour. Today, in-app gestures of mobile apps are quite natural to us that we do not even consider them unique. Undoubtedly, the in-app gestures are the powerful mode of interaction. As the mobile devices have evolved from, just a brick to intelligent computers powered by our fingertips. It has a lot of potentials to keep up the pace. There are number of gestures of all shape and sizes, listed in a graphic below. All of them are pretty much common because almost all the mobile phone users are using them. Designing touch gestures for mobile apps is not at all an easy task. It demands the excellent ecosystem, strong planning, conceptual foundation and appealing designs. Lack of any of these elements might risk the value of ROI when the product is finished. 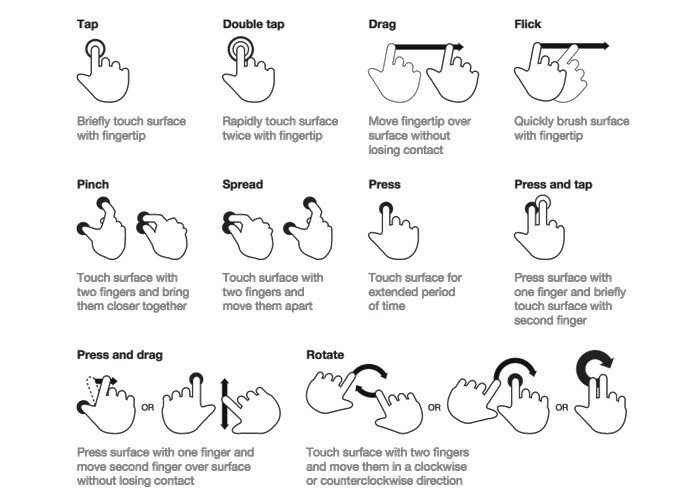 It is indeed very important for Mobile App Developers to keep all of these gestures within the reach of users’ thumb. As almost all the mobile phone users use their thumb for navigation purposes. Hence all the mobile app functionalities should be concentrated. The reason why in-app gestures are natural and intuitive is that they resemble interacting with real-time objects. There are more than one reasons why users prefer in-app gestures to use it over the button. The gesture saves users’ time by reducing the number of steps needed to perform any particular action. Now, everything is just a touch away, and due to smart in-app gestures, the actions such as surf, scroll, and search, click and rotate, are becoming easier. With the less number of buttons on the screen, we have more space which can be available to display valuable content on the screen. In the present era, you see no buttons on the display itself, and with that, the touchscreen sizes have been increased. The gestures are the logical solution to make the app aesthetically clear and pleasing. The navigation using gesture removes on-screen unnecessary icons buttons and provides breathing space to the app. Which allows the user to have more interactive experience without any distractions. In-app gestures improve the engagement ratio. Also, renders the tactile experience. It makes interaction with visual information more natural and spontaneous and makes the user believe that he/she is having an interaction with something tangible. The user engagements is an essential factor when it comes to Mobile App UI Design, and in-app gestures play a vital role here. With better engagement, the most impactful factor to UI Design is ‘Ease of Use’. Once you learn the app gesture, it feels like a delightful experience. The Mobile App Maker needed to ask - ‘For whom you're designing?’ - And should keep the targeted audience in mind. Also, guide your users or give them a tour of the gestures step by step, starting from the most relevant options for interactions. Gestures have a close link with animations in Mobile Application Development, as it nurtures an illusion of interactivity for your app users. When animation is pairing with Gesture, it makes our nervous system believe that it is having an interaction with something touchable with a perfect visual acknowledgement. When it comes to natural interaction, the focus will be on how the user is having an interaction with the app. For an instant, instead of hitting or tapping on the like button, what if a user can actually draw it out on a screen? In 2018, we have seen that there is more emotional intelligence (EI) integrated into the Mobile Applications. Now, the EI is a powerful way of making the experience more delightful and engaging. Animation has become the profound standard for each innovative gestural interaction. Today, there are countless mobile apps adopting this convention. Sometimes the gestures are not that easy to learn or remember. Let us take an example, most apps have a single finger gesture, now, the same gesture using two-fingers means another. Using three or four fingers makes it dreadful. Most of the times, gestures does not send an ACK. Which means if it is getting any wrong information from your side (As most of them do not leave any record behind) you are not going to get any help to understand what just happened or why your action has no response from the other side. Gestures are not consistent for Mobile Apps yet not always flexible. For an instant, in Apple mail, to delete an unread email user have to swipe left, whereas in Gmail if you swipe left marks email as unread. Now before the in-app gesture integration, Mobile App Builder need to make sure they are using proper visual analysis tools. Do not forget ‘Seeing is Believing’, now make sure the Mobile In-app Gestures are seamless as well as appealing for the users. The gesture-based user interface has rock-solid possibilities to enhance the UX, also do consider them as a powerful mode of interaction. Today, designing a mobile app without gesture may cause a downfall for you. So to build a successful app, Mobile App Development Company should design a meaningful gesture and bring it to the public attention and make them perform a particular action. Today, we see there are no physical buttons available on a screen, the phones are powered by our fingers-touch. Because smartphones have evolved to a greater extent over time.